Scale-model cars, especially 1:18 scale ones, are a true joy. They are small enough to fit on a bookshelf or a desk, but also large enough to house some incredible detail. I never knew I wanted a scale model tractor and semitrailer to go along with my little collection until now. Mercedes is offering a 1:18 scale Actros GigaSpace tractor and semitrailer unit that can fit six 1:18 model cars. The model is made up of over 500 individual components; 167 of them are zinc, 80 are plastic and 32 are etched parts and they’re all held together by 225 screws, pins and tools. The platforms and loading ramps even have the hole-structure just like the real one. The cab is tippable, so you can open it up to check out the engine. You can open the driver-, passenger-side doors and the service flap, too. Even warning notices from the real thing are there. And, of course, the Mercedes star in the grille lights up. The whole thing is 44.5 inches long and weighs 22 pounds. 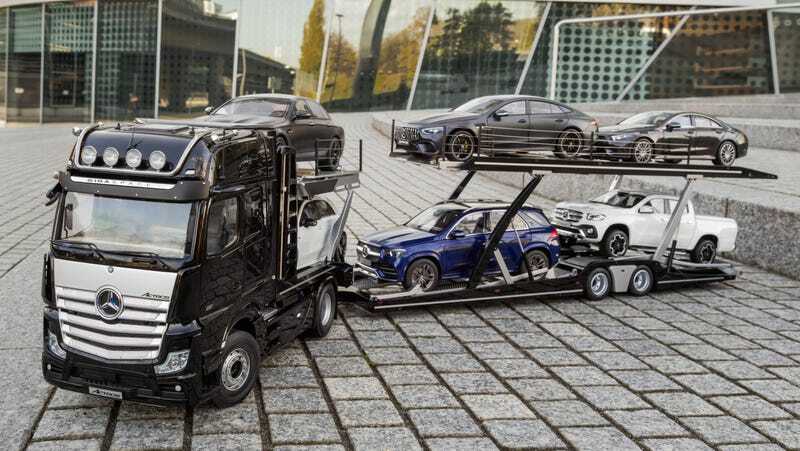 The truck in Mercedes’ press photo is shown carrying an array of Mercedes model cars, but I don’t see why you can’t put other model cars on it. Once, in order to encourage my budding automotive interest, my dad came home with 1:18 scale models of a 996 Porsche Turbo S, a Lamborghini Gallardo, an Aston Martin DB7 and a Ferrari 360 Challenge Stradale for me when I was a kid. They were amazing and lovely and I used to spend hours looking at them and peering inside the amazingly details cabins. They’re sitting under a display case on my bookshelf now, but I would absolutely take them out and display them on this Mercedes model truck. Mercedes didn’t mention how much the truck costs, but my birthday is next month. I trust you’ll figure it out by then.